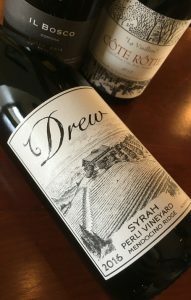 2016 Drew Family Cellars, Syrah, Perli Vineyard, Mendocino Ridge. Of Drew’s latest releases you’ll find some amazing Pinot Noirs and Syrahs, that include this beautiful and richly flavored Perli Mendocino Ridge bottling, it seems the most forward of the three Syrahs on offer and lingers with studied elegance and freshness. The Perli Syrah by Jason Drew is one of the best examples of cool climate Syrah in northern California using California clones, which include McDowell and 877, grown at elevation, the Perli Vineyard is ten miles from the ocean, 2,200 feet up on a steep northeast-facing slope of thin oceanic soils. This site on a sunny ridge top is kept cool by Pacific winds, making wines, according to Drew, with immense structure, concentration and complexity, it has a different profile than some of Drew’s other Syrah offerings that are closer to the ocean and have Chave (Hermitage) selection clonal material. Typically for Perli, Drew used about 50% new oak and employs a bigger cask or “Puncheons” fermenting with about 50% whole cluster, that is done 100% native yeast, with gentile handling and punch downs before being raised in the cask where the wine is only gravity racked twice before bottling. Loaded with ripe black plum, vine picked berries, blueberry compote and briar/spiced currants this new release Perli Vineyard Syrah is compelling from the start, adding a dark floral tone to the inviting almost opaque purple/garnet hue in the glass, with air it adds a multi dimension and complex array of spice, licorice, mineral, meatiness, earth, mocha and just a faint subtle hint of toasty sweet oak. These 2016 also offer a lift of acidity that makes them a touch more light-footed in feel, but don’t let that fool you these are wines of wonderful inner beauty and density that will continue to develop and evolve on the coming decade, these are impressive wines, some of the very best in California.